Do you need help managing life between busy schedules and sleepless nights? Living alone, away from home can be something mentally tiring. We need support to keep us going at the tough times and at times when we are down from within. To help bring harmony in life the giant search engine – Google – created a smart and intellectual thing called Google Home. Google Home is the latest product under the internet of things’ category. Launched last year, this trending gadget is a sleek Google product that ‘communicates’, set alarms, reminders, take notes, turns off lights and answer all your queries. Amazing! Right? Powered by Google Assistant the device can be activated by simply saying ‘Ok Google’. Google has already gained name and fame as the best search engine. Today, we don’t say ‘look for something on the internet’, rather we say ‘why don’t you just Google it’? With this reputation and luck, the search engine has crafted a device that can look up on the internet for any query uttered by the Google Home users. Using the device one can get real answers. The device can answer queries from eight different categories – calculator, dictionary, facts and information, finance, nutrition or food ingredients, sports, translation and more. If you have a French friend, but find it tough to communicate with him/her, simply ask Google home to translate what you say in English to French to help your friend understand you better. You can also get information on sports. For example, if there is some baseball match going on, simply ask for the score and Google will answer that for you. Similarly, one can seek answers for queries related to investment and can even use Google to search some words online. With Google home, your home will never be a quite a place. That doesn’t mean Google Home is noisy, rather you can voice command Google to play music of radio for you. Depending on your mood or occasion, you can ask Google Home to play some melody. 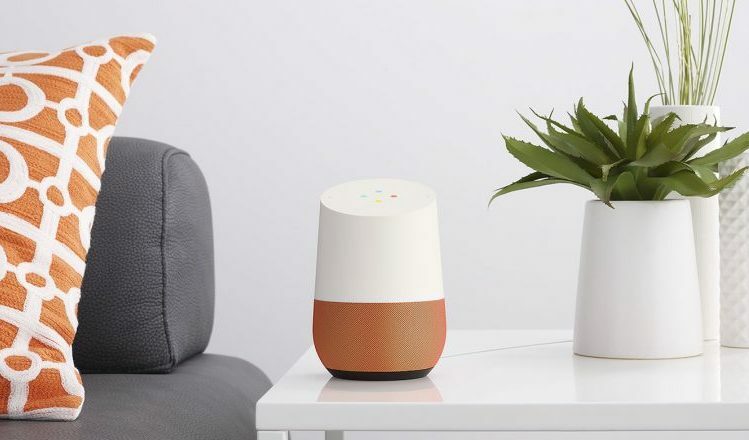 Google Home can play music using mobile app audio streaming, TV streaming and control, speaker streaming and control, radio, podcast and more. A simple voice request is enough to trigger Google Home play music from services such as Google Play Music, YouTube Music and Spotify. You can also create special playlist and ask Google home to play it. Suppose you have created a playlist for the Saturday fun time, all you need to do is command Google to play “Saturday playlist”. The best thing about the Google home device is that multiple Google home devices can be connected to play the same song in all the rooms. Google home’s integrated high-excursion speaker clear highs and rich bass. You cannot only plan music, but also use the device to better organize your life. If you wish and allow, Google Home can be personalized to give you company at home. Using the device one can retrieve flight information, set reminders, timers and alarms. Besides, you can also personalize to know about near and around your location. The device is a home assistant. It does almost everything that a nice room partner might do. Using the device, you can create a shopping list, set timer, check the weather forecast, schedule car services and more. The device is so much of fun as it never lets a person feel alone. Even if you are living alone, you will feel a constant company with you with this amazing device. The device just like a real friend or housemate can turn down the lights, set alarms and perfect room temperature. 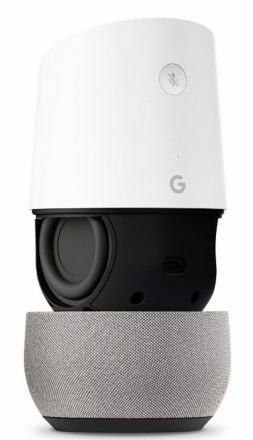 Google home can be easily connected with devices such as Chromecast, Nest and Philips Hue. Besides, its sleek design and colorful base can be matched with home décor to meet the style of the house. The design of the device speaks for itself. It can be used with multiple Google home devices. Google Home can be set up easily with three simple to follow steps. To get started all you need to do is insert power cable into Google Home, insert power adapter into a wall electric receptacle, download and run the application on a smart device; and the device is ready to use. Although Google Home runs on voice command, it also has touch control on the top of the device for those rare moments when voice just won’t do. With the touch control you can play/pause music, raise and drop volume, start request and more. Google Home gives the entire control to its owner. With tiny lights on the head of the device, Google Home communicates with its owner to notify if it is recording the command or not.